Wolf business needs extreme caution. Stepping over a fallen pine trunk, furtively checking in all directions. Let us take a brief look back at the doings of the wolf family and the development of their offspring. With the alpha couple’s mating in February the wolf flock broke up. The alpha female has such a strongly dominant position in the flock that normally young females don’t come into heat in such a stressful situation. So, if hunters in winter can eliminate the lead animal(s) in a flock, that flock may not have offspring that year. Suppose that in our wolf family four to six cubs were born around the turn of April- May. The female wolf will not leave the cubs for a couple of weeks and the male cares for the family. The cubs are suckled for one and a half month; of course the parents begin to feed the young chewed and digested food as well. Sometimes the beta female, or aunt, cares for, protects and feeds the cubs. She has the second-rank position in the flock. At the turn of July-August they begin moving around by and by with the cubs, introducing the world to them. The previous year’s young also start to join the flock, they are one or two, the increase in the wolf population so low. A well motivated question will then be - if there were four to six cubs this year, how then can the increase be small? 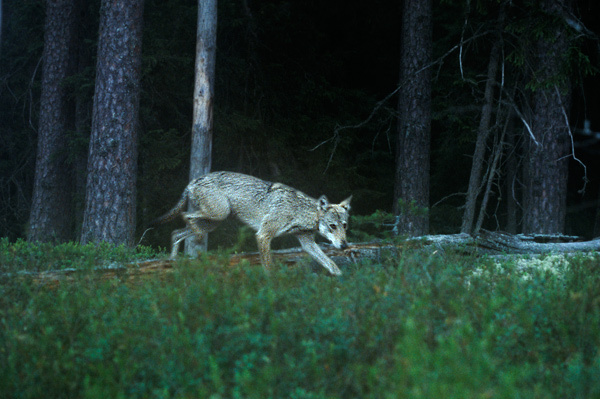 Wolves, living in flocks, have many illnesses of all kinds. Of this year’s cubs usually only less than half become one year old, and mortality during the second year of life is also high. Of course the wolves have to provide their offspring with the necessary skills for life. Nature has so designed, and in August learning starts. A sheep flock moving in a large enclosure is a mobile and interesting prey for wolves, and this has nothing to do with ownership or ethics. Domestic animals slain by wolves have quite definite and specific characteristics – the attack is in the neck area. Killer dog flocks are around too, but their killings look more like “thrashing and severing“ the sheep; regrettably many such killings go to the wolves’ account. At the start of elk matings in September the wolf flock is together and the cubs bigger. The adult elks are engrossed in their own doings and at this time it is not uncommon that a young 150-kilo elk, moving on its own, gets slain. Even two grown wolves can manage it. The cubs of course collect experiences for life, running along and observing. Watchdogs are seldom slain; old experienced wolves may do that; they have been excluded from the active flock. Often the wolf flock also kills its own old members – a vital flock is important, not unneeded mouths. Killing of hunting dogs or stray dogs occurs too. In the opinion of many experts this generally has to do with the wolves protecting their territory against „intruders“.